The management of industrial heritage sites requires rethinking in the context of urban change, and the issue of how to balance protection, preservation/conservation, and development becomes all the more crucial as industrial heritage sites grow in number. This brings into play new challenges—not only through the known conflicts between monument preservation and contemporary architecture, but also with the increasing demand for economic urban development by reusing the built heritage of former industrial sites. This book explores the conservation and change of industrial heritage sites in transformation, presenting and examining ten European and Asian case studies. The interdisciplinary approach of the book connects a diversity of rationales and discourses, including monument protection, World Heritage conventions, urban regeneration, urban planning and design, architecture, and politics. 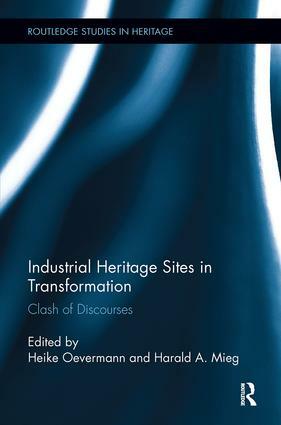 This is the first book to deepen the understanding of industrial heritage site management as a networked, multi-dimensional task involving diverse social agents and societal discourses. Heike Oevermann is researcher in urban and heritage studies at the Georg-Simmel-Center for Metropolitan Studies at Humboldt Universität zu Berlin, Germany. She coordinates a three-year research project on industrial heritage sites in Europe (DFG). Harald A. Mieg is Honorary Professor in the Institute of Geography, Humboldt-Universität Berlin, Germany. He is responsible for the implementation of undergraduate research at the University of Applied Sciences, Potsdam, Germany. He has conducted research on sustainable urban development, metropolization, and innovation.